It's Intel, of course, that has been first to assault our noses with a fusion processor, the chip commonly known as Clarkdale. Commonly known, that is, because Intel's branding is now so utterly baffling, codenames are literally the only way to keep track of the hardware. Is it a Core i3? Perhaps a Core i5? Hell, in mobile trim, it's also a Core i7. But we digress. The point here is that with the arrival of the world's first fusion processor come new requirements for motherboards. With a graphics core thrust ignobly up Clarkdale's dual-core behind, there's a need for wiring and ports to drain the graphics output from the CPU socket. This is provided by Intel's new H55 and H57 chipsets. It's the latter we're sniffing here for the first time, courtesy of the Asus P7H57D-V EVO. For the record, the list of differences between the H55 and H57 is not massively fascinating, but is most notable for RAID support. On the H57, that is. Anyway, in terms of video ports, you get VGA, DVI and HDMI. There's no DisplayPort which may or may not prove to be a shortcoming. Currently, the jury is out. Other highlights include dual-channel DDR3 support, twin PCI-e 16-lane slots enabling twocard SLI and CrossFire action, six old-school SATA 3.0Gbps ports and a pair of spangly new 6.0Gbps sockets. You also get a pair of USB 3.0 connectors. The other four are plain USB 2.0. Performance-wise, the P7H57D-V EVO doesn't disappoint. We managed to crank up the base clock of a Core i7 870 from 133MHz to a giddy 210MHz. You can be very sure it will be your CPU and not this board that flakes out first, in other words. And yes, that does mean both the new chipsets and this board support all existing LGA1156 processors, not just fusion chips. It's a typically solid effort from Asus, then. But here's the rub. We can barely think of any reason you'd actually want to use the GPU in Clarkdale. Sure, it's at least twice as good as any previous Intel GPU. But twice as good as utterly rubbish is still pretty futile. Even the most pitiful discrete graphics will give the new core, known as the Graphics Media Accelerator 4000HD, a thorough hosing for gaming grunt. Of course, you could argue it gets much improved 2D video acceleration support. That's handy for home cinema. 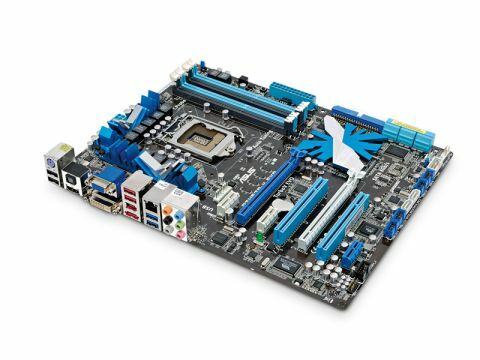 But then this is a full-on £145 desktop board, not a home cinema board. We should stress that none of this is Asus's fault, it's purely down to Clarkdale. But there's no getting round the fact that with this board, as with Clarkdale, you're probably paying for things you don't want. It all smells a tiny bit rotten.